Subscribe to our FREE monthly Readers Write email. You’ll receive links to new articles in our online magazine and an opportunity to share your perspective in our Readers Write column. As a subscriber, you’ll see more content than what’s on the web site! 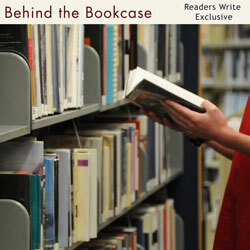 Take a look at some of the awesome Behind the Bookcase stories you’ll read about as a subscriber. Please add our email address read@booksmakeadifference.com to your address book so our messages don’t get stuck in a SPAM folder.